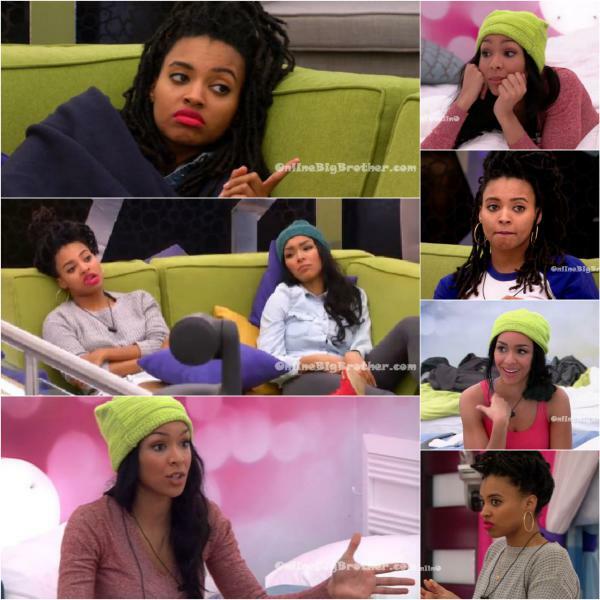 Big Brother Canada 4 Eviction & HOH Spoilers! The first week of Big Brother Canada 4 Live Feeds is now behind us with another exciting week with a new house guest in power about to begin. As head of household this week, Jared nominated Loveita and Sharry for eviction. This week was all about payback for the Third Wheel Alliance (Jared, Kelsey, Raul) as Loveita had nominated and campaigned to get Kelsey out the previous week. After Christine won the Power of Veto and decided not to use it on either of the nominees, it sealed the fate of one of them being evicted tonight. 9:50am – 10:40am Big Brother wakes up the house guests. Dallas asks Cassandra says she thinks the HOH will be some kind of physical. I don’t think it will be mental again. Dallas agrees. Dallas asks so you’re on the same breath as me, getting rid of Sharry? Cassandra says yes. They fist bump. Cassandra says she already told Sharry. Dallas asks does it feel better? Cassandra says yeah. Dallas says I just want to let you know if I win this HOH, you’re safe with me. I’ve got bigger fish to fry. Nick says Dallas is playing both sides again. Nick says he’s gotta distance himself with Dallas before they find themselves on the block guilty by association. Phil is stressing to Nick he has to build relationships with people other than Maddy. Maddy’s time in the house is limited. Phil stressing for Nick to not forget why they are here. 5pm Maddy and Ramsey are hanging out on the couches. Maddy says Jared’s way to good for her (Kelsey). I hate how pretty she is. Ramsey says yeah that’s called jealousy. She only really has nice eyes. I don’t like blondes. Maddy says but I’m blonde. Ramsey says you should make your hair darker. Maddy says I think Christine is pretty fake too. Ramsey says I like that you say that. Maddy says Christine hates Raul but she’s so nice to him. Maddy says that Kelsey is a dumb player. 1pm Kelsey heads out to the hot tub room and tells Phil her plan. Phil says that Dallas isn’t a smart guy. He’s poisonous. Kelsey tells Phil that she trusts him and his brother. Phil says that Nick is going for the HOH. He’s going to try and win it. Phil tells Kelsey to relax. You’re going to start playing too hard. Its only day 13. You need to just chill and relax. Phil tells her its a good plan. He says that everyone is a threat in this game. Loveita is so anti-social it will sewer her. 10:45am Tim, Cassandra and Nikki are talking by the pool. Cassandra thinks this next HOH will be an endruance. 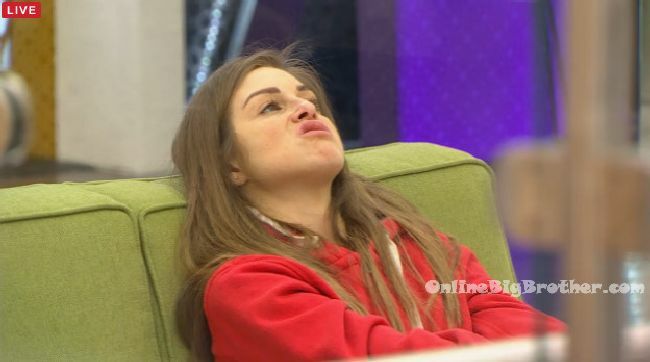 Nikki says that they had an endurance on the UK season and she lasted 7 minutes while others lasted 14 hours. 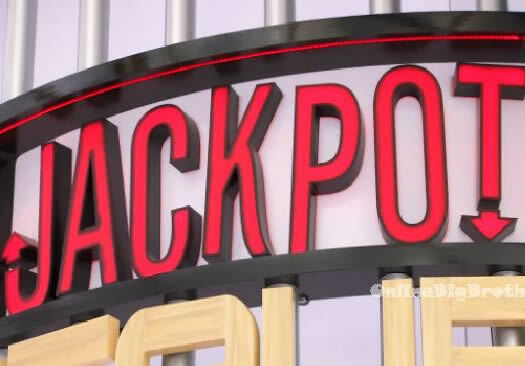 Cassandra says I wonder if there’s a secret room behind the jackpot sign. Tim says yeah! 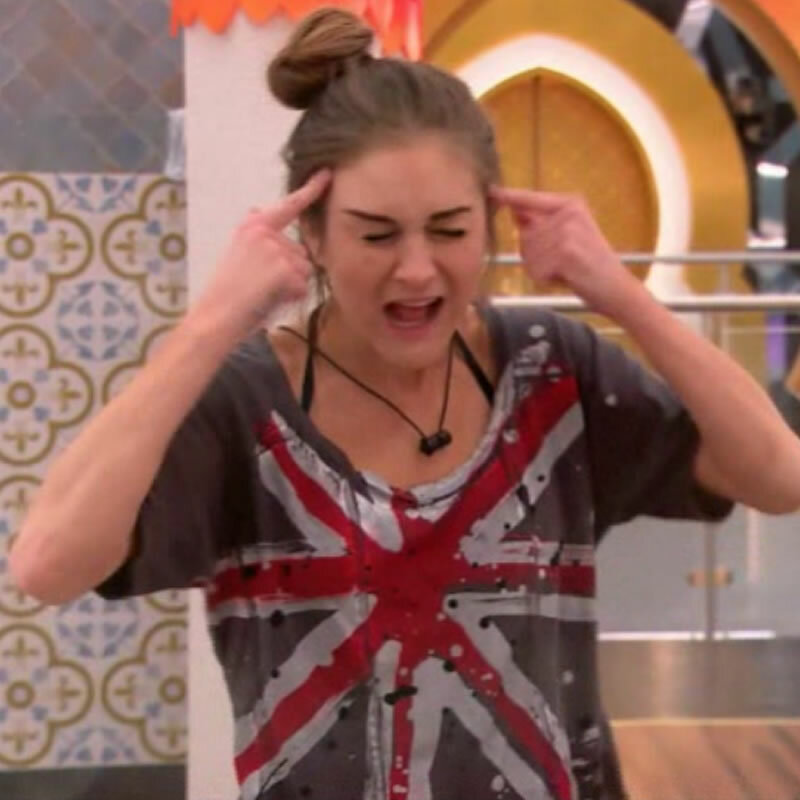 Cassandra says but the only way to get to it is through the HOH bathroom. Loveita joins them and says that she’s said what she need to say and doesn’t want to shove it down people throats. Talking about keeping Sharry and getting Lovetia out. They want to cut a 1 week deal with Sharry. Kelsey going on about Loveita having to go mentions how she’s talked to the boys and they’re all for it. Kelsey says If Sharry stays next week she’s on the block If Lovetia stays next week she’s not on the block. 4:45pm Sharry is campaigning to Dallas. She says that she doesn’t even understand why she’s in this position. I should have just stay far away from Loveita. Worked with her but stayed away. Sharry says you have to be careful of who you’re straight up with because they’ll probably use it against you. Dallas agrees. Dallas says I am being f**king vocally honest about who I want out of this game. You know what I mean. Sharry says yeah. Maddy joins them. 2pm In the bedroom – Tim is talking to Loveita. Tim tells her that if she wasn’t HOH the first week you wouldn’t be here this week (on the block). 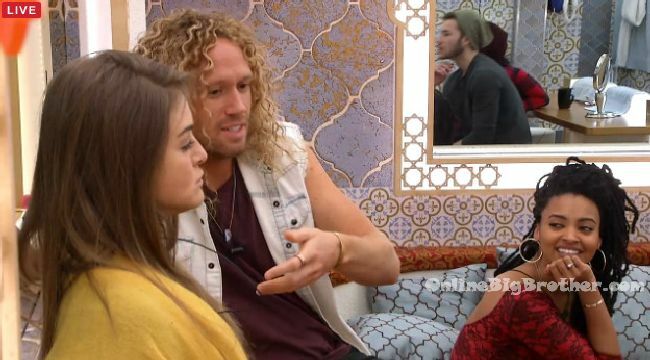 Tim says that if you convince Jared you’re the one to keep, then Raul and Kelsey will vote to keep you. They’ll do whatever he says. Loveita says he isn’t telling anyone how to vote. Tim says until you address what started that whole chain of events you will always be judged for it. It’s got to genuine. Jared can read bullsh*t a mile away. Don’t bullsh*t him. 10:50am Loveita is talking to Mitch in the havenot room with Joel. She is campaigning hard. Mitch says that he thinks Loveita has a good chance to stay. He likes both of them but that doesn’t really know where Sharry stands with him. Loveita says you don’t have to be outwardly open for me. If I stay and win HOH I can take the hit. I know I have 2 other votes outside of this room. She says she has Cassandra and Dallas. (With Joel) Mitch says that he thinks she can get the brothers too. Loveita says I’m going to support my people and I’m not going to betray my people. The feeds came on a bit after 10:30pm after being off since 7ish. They again went dark around midnight. Many of the houseguests were liquored up and of course Niki was freaking out. 10:30pm Houseguests get a pool party for completing a task. There’s plenty of Beer, Vodka and food. During the party Niki brings up all the alcohol that has been drank and starts to flip out.